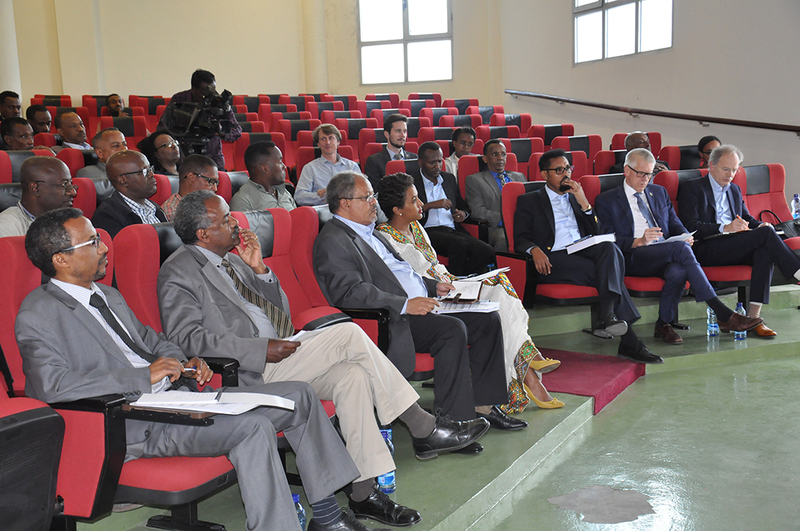 The Oxford Handbook of the Ethiopian Economy Launched at AAU. Addis Ababa University launched Handbook of the Ethiopian Economy which is the first ever Oxford Handbook on a single African country on 8th February, 2019 at College of Business and Economics Eshetu Chole Hall. The book focuses on post 1991 economic development policy and strategy; the analysis is set against the background of the long history of Ethiopia more specifically on the imperial period that ended in 1974, the socialist experiment of the Derg Regime between 1974 and 1991, and the policies and strategies of the current EPRDF government that came to power in 1991. The book analyzes the country’s unique model of development, where the state plays a central role and where a successful industrialization drive has challenged the long-held erroneous assumption that industrial policy will never work in poor African countries. Professor Tassew woldehanna President of AAU welcomed guests and participants of the ceremony. In his welcoming remarks, prof. Tassew noted that the Ethiopian economy has been one of the fastest growing in Africa, and indeed in the world during the past fifteen years. 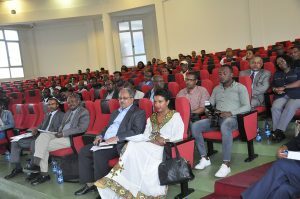 He added that six authors of the handbook are from Addis Ababa University (CoBE, CSS, CDS) implying that AAU is contributing to the country’s development through its research and publications.Over the last few years, said, Prof. Tassew, the University’s scholarly papers published in reputable journals has doubled. In 2015 and 2016the university produced more than 800 peer reviewed article, but since 2017 more than 1400 articles were published. As a result of this our ranking improved significantly both worldwide and among African universities, said Prof. Tassew, citing the recently announced ranking made by ‘University Ranking by Academic Performance (URAP)’, where AAU ranked 887th in world ranking of 2018/19 and 16th among African Universities which was 1003rd in the world and 19th in Africa in 2017/18. Dr Arkebe Oqubay, Senior Minister and special advisor to the Ethiopian Prime Minister and one of the editors of this handbook on his part stated that the handbook focuses on Ethiopia because Ethiopia is one of the fastest growing economies in Africa and the country’s unique model of development. The ceremony also featured panel discussion. The panel discussion that proceeded was moderated by Professor Fantu Cheru Senior Researcher in African Studies Center, Leiden University. The panelists were professor Tassew Woldehanna “Poverty and inequality in Ethiopia (1995/96-2015/16), Professor Shiferaw Bekele“ Ethiopia’s transition from traditional to a developing economy( 1890s-1960s) and Professor Christopher Cramer “ Policy, political economy, and performance in Ethiopia’s coffee sector’’. The ceremony was concluded with closing remarks by Professor Tassew. He praised the editors, authors and all involved individuals for their tremendous contributions to the Oxford Handbook of the Ethiopian Economy.